Otto William Theel, Jr. 92, passed away 10 26 15. He was born November 9, 1922 in Leavenworth, Kansas to Otto William Theel, Sr. and Modella Delphine Lyons Theel. After high school he attended Hunting College for 2 years before graduating from the University of Kansas and then the Univesity of Kansas Medical school. He interned at Trinity Lutheran Hospital and for 42 years was a member of the medical staff, serving as president of the medical staff in 1971. He was in the Navy from 1942 to 1945 and was a captain in the army serving at the Presidio in San Francisco from 1951-53. Dr. Theel organized the Church of the Nazarene Kansas City District Laymans League serving on the board for 25 years and also as president. He served on the Kansas City District advisory board and was treasurer at the Kansas City rescue mission. 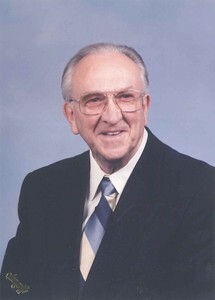 Dr. Theel was a faithful member of Nall Ave. Church of the Nazarene and on its church board for 50 years. He was a strong supporter of MidAmerica Nazarene University creating through the Board of Trustees the Honorary Alumni Association to raise scholarship funds. In 1969 he was honored at the school with the Laymen's Award of the year. He also served on their Board of Trustees as well as a member of the Foundation Board of Directors. After retiring from his medical practice in 1990 he and his wife Beulah traveled extensively to visit family, friends and places of interest. Dr. Theel was preceded in death by his parents, two sisters, Betty Marlow and Shirley Lucas and brother Donald Theel. He is survived by his wife Beulah Lindley Theel of the home, daughter, Joan Akers from Minneapolis, son Larry Theel and wife Betty of Shawnee, and daughter Linda Shaw from Oklahoma City. He had nine grandchildren, 15 great-grandchildren, and 11 nieces and nephews. He was greatly loved by all and will be missed. Add your memories to the guest book of Dr. Otto Theel, Jr.. I have so many good memories of Dr. Otto, beginning when Larry and Betty began dating, punctuated later by family dinners and work on his Honorary Alumni project at MNU. I was always impressed by his commitment to helping others, his generosity, and his commitment to Christ. I pray you all will sense the comforting presence of the Lord in these days. So sorry to hear of the death of Otto. He was a great friend of my father, G. Joseph Pierron, M.D. in medical school. My mother and father loved to tell the story of discovering the steam tunnels underground at KU with Otto. They said that they were walking along and Otto spied a manhole. He climbed up the rusty ladder, was able to poke the manhole up just as a truck drove over! My Dad laughed til he cried saying he'd never seen Otto move so fast as he did off the ladder!!!! Godspeed, Dr. Theel!